I'm going to let you in on a little secret. Moms, your kids are going to like this. Are you on Pinterest? Do you use the secret boards? If so, you can start this right away. Ready? It is really easy. Start a secret board WITH each of your kids. Maybe you already have a secret board for them filled with fun things to make and do with them. This board, though, includes them. No matter their age, they see you online. Let them see you planning with them. I started with my oldest daughter. We pinned ideas for things she could make for her little sister and brother. Then my younger daughter added me to her wish list board. 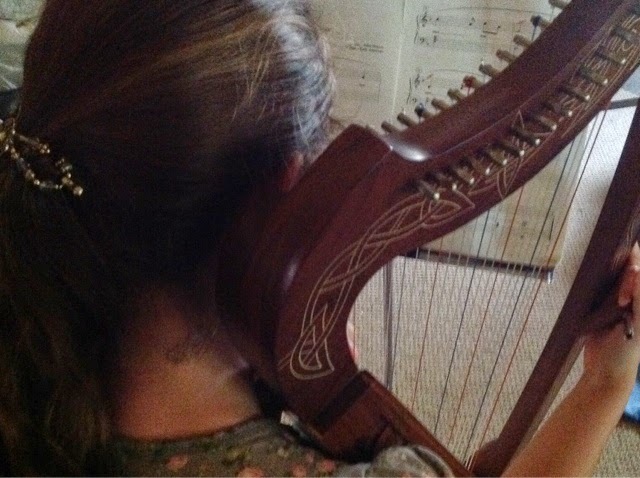 She added the harp that she wanted to that board then saved up until she was able to purchase it. My son asked us to let him have a Pinterest account. We compromised with a secret board. Both of his big sisters and I have it as a shared secret board, so he can pin to it with any of us. And we all surprise him by adding things to it. Like this. I know, I almost didn't pin that one, but he already likes practical jokes and whoppie cushions, so I knew he would want to try it. I had to repin that to the not-secret "for my son" board to be able to share with you. That board was started before the secret one, only Joseph didn't know about it. I pinned a variety of things I thought that he would enjoy. Now he knows about that board, too, and even recognizes some of the ideas that I have tried out. Follow Jennifer Miller's board for my son on Pinterest. Do you have any tips like this of special ways you include your children in everyday things? Another special thing each of the kids still do with me is our journal books. I share one with each of my children.